It’s a CSKA vs SKA showdown in the Western Conference final for the fourth time in five years after both teams wrapped up 4-1 series wins on Thursday. CSKA outlasted Dynamo to secure a 3-2 verdict before SKA won a humdinger 5-4 in overtime to join its rival in the next round. A goal from Linden Vey early in the third period was enough to give CSKA the edge in this game and send the Army Men into the Western Conference Final for the fourth time in five seasons. Vey’s effort snapped a 2-2 tie and Dynamo, despite earlier tying the game twice, was unable to respond for a third time. It was a classy goal worthy of deciding the series: CSKA claimed the puck in its own zone and Kirill Kaprizov slung the puck diagonally across the ice to Mikhail Grigorenko. Advancing into Dynamo territory, Grigorenko fired a pass behind the retreating defense for Vey to slide his stick forward and score from between the hash marks. Impossible to defend against, blisteringly effective and good enough to secure the win. Although the scoreline suggests a close game, in truth CSKA was always on top here. Dynamo managed just 11 shots in the first two periods and 19 in total. CSKA had 34 attempts on target, despite playing cautiously in the closing stages to preserve its lead to the hooter. The Army Men spent far more time on the attack over the course of the game and completed the series with just five goals allowed in five games, clearly underlining the level of control Igor Nikitin’s team enjoyed throughout this encounter. CSKA opened the scoring in the 14th minute. The home team had never been slow to fire in shots on Alexander Yeryomenko’s net and got its reward when Alexei Marchenko’s effort was redirected beyond the Dynamo goalie by Pavel Karnaukhov. The goalscorer continued to make an impression on proceedings, getting into a fight with Vitaly Menshikov that ensured both players were on the sidelines when Dynamo tied the game. Vladimir Krikunov, head coach of the Blue-and-Whites, has repeatedly lamented the lack of scoring from his forwards in this series. Once again, it was a defenseman who got the goal. Yegor Zaitsev blasted a shot under Ilya Sorokin’s glove after Vladimir Bryukvin put the home defense in a spin in the final minute of the frame. Those frustrations with the forward line no doubt intensified in the second period when the team’s leading scorers, Dmitry Kagarlitsky and Vadim Shipachyov both took minor penalties. The second of those, Shipachyov’s high stick on Kirill Kaprizov, proved particularly costly: from the power play, Jannik Hansen diverted a Mat Robinson shot past Yeryomenko to restore the home lead midway through the game. Krikunov finally saw one of his forwards score in the 39th minute of the game. Dynamo had a 5-on-3 advantage, with CSKA further hampered when Marchenko lost his stick. Vadim Shipachyov’s first-time pass found Dmitry Kagarlitsky and he rifled the puck home from a tight angle to make it 2-2. It was the first time in the series that Dynamo had scored more than once in a game and it ensured that CSKA was pegged back once again at the end of a frame that it had dominated for long stretches. However, once Vey had restored his team’s lead at the start of the third period, Dynamo struggled to really test Sorokin in its quest for another tying goal. There were half chances: a Miks Indrasis play from behind the net that did not find a Dynamo stick in the slot, a Shipachyov feed that feel for the Latvian, only for the mishit shot to drop comfortably for the goalie. Even the closing stages, with Dynamo playing 6-on5, offered no serious alarms for the Army Men. CSKA’s win closed out its first ever KHL playoff series success against its cross-town rival. The teams met twice before in post-season, with Dynamo taking the honors on both previous occasions. We probably lacked a little bit of strength for this game. We really wanted to get the first goal and couldn’t do it, that took a lot out of us emotionally. Then it was a roller-coaster, going down and fighting back twice. In the end we lost, but at least we could see which players made a contribution. We can see who can move on with us in the future and who will probably have to leave. The guys gave everything today. How will you prepare for next season? Do you think this is Dynamo’s limit? I’ll prepare like any coach.If we’re talking about this team, with a bit more luck we might have done slightly better. But it would be difficult to climb much higher than we did. I’d like to thank Dynamo for a good series. I think we played a good game today. Psychologically it wasn’t easy – twice we got in front, twice they tied it up. But in the third period we waited for our chance and then played responsible hockey to finish the job. SKA completed the series win most people expected after the Petersburg team returned home with a 3-1 lead over Lokomotiv. But game five was anything but straightforward for the Army Men. Down early on, SKA rallied impressively with four goals in the second period but stumbled again as Loko tied the scores in the third. In overtime, though, the visitor ran into penalty trouble and lost out to Dinar Khafizullin’s power play goal in the 67th minute. It was the third power play goal for SKA on the night and it came after a string of Loko penalties. Tow minutes into the extras, Stepan Sannikov took a tripping call. Ninety seconds later a too-many men verdict left Loko facing 30 seconds of 3-on-5 play. After surviving the worst of that scare, the visitor lost Georgy Ivanov and had to endure another 20 seconds with a two-man disadvantage. The pressure finally told when Loko’s weary four-man line-up allowed a Khafizullin point shot to find the target and bring the game and the series to a conclusion. Visiting goalie Alexander Salak reacted angrily to the game-winner, adamant that he was unfairly blocked by Sergei Plotnikov as the shot came in; the SKA forward played a big role throughout the game and finished with three assists but his tight screen on Loko’s goalie certainly upset the Czech. Salak’s protests, though, came to naught; SKA advances and Lokomotiv’s season is over. However, Lokomotiv deserves great credit for turning this trip to the last chance saloon into one of the most memorable games of postseason. The Railwaymen arrived ready to fight for their playoff survival and delivered a statement of intent as early as the fifth minute when Denis Alexeyev opened the scoring. 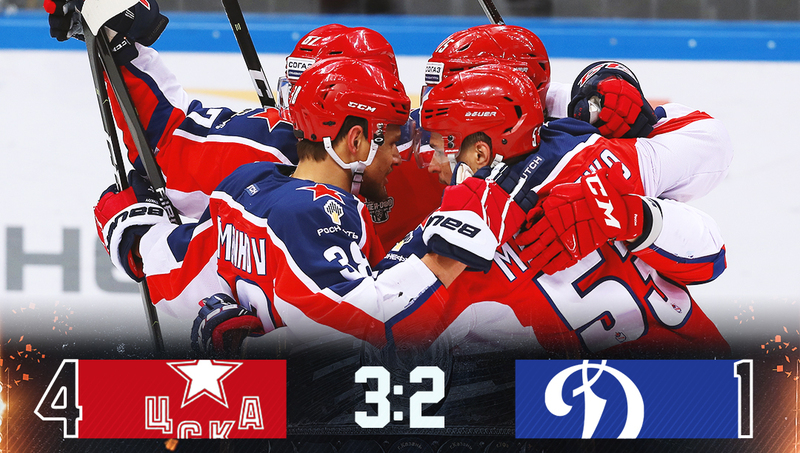 A rugged performance in the opening frame limited SKA to just six shots at Ilya Konovalov. If the first period was frustrating for the host, the second was a transformation. It took just 34 seconds for Nikita Gusev to tie the game when he scored off the rebound from Sergei Plotnikov’s shot. Four minutes later, with Loko reduced to three skaters, the Plotnikov-Gusev combo struck again as the former Lokomotiv forward slid a pass behind Konovalov’s back for Gusev to score at the far post. 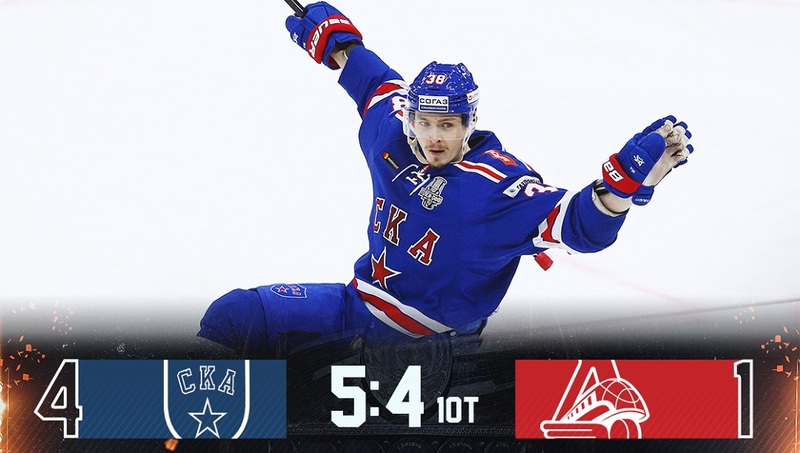 When Artyom Zub’s point shot found the net on the half-hour, it looked like Loko’s season was coming to a rapid end, with memories of SKA’s 6-1 success here in game two coming inevitably to mind. But the visitor dug in. Sannikov quickly pulled a goal back and a fight between teenage defenseman Daniil Misyul and Maxim Karpov quickened the blood. Lokomotiv had proved that it wasn’t giving up without a battle. Even so, another SKA power play goal, created by Plotnikov and Gusev, finished by Alexei Byvaltsev, seemed to have give SKA an unassailable advantage. With nothing to lose, Lokomotiv found the strength for one last fightback. The third period resembled the first with Loko doing a fine job of stifling SKA’s offense and creating chances at the other end. Daniil Apalkov reduced the deficit after five minutes of play when he converted an odd man rush with a well-placed one-timer off Sannikov’s feed. Then, in the 53rd minute, the visitor tied it up. Yegor Korshkov got around the back and was allowed to set up the unmarked Rushan Rafikov in front of the net; Magnus Hellberg, exposed, had little chance of making the save. SKA came closest to finding a winner in regulation: young Mikhail Maltsev’s raid into enemy territory ended with the puck bundled into Alexander Salak’s net but the video review found a foot was used to push it over the line. Overtime beckoned, and with it came Loko’s penalties and Khafizullin’s winner. Today’s game was exciting, like the whole of this series. Thanks to Lokomotiv for that. Every series teaches you something new, especially about playing as a team and taking responsibility together. It’ll be a different challenge against CSKA. We wanted to rest some of the guys who played earlier. Datsyuk has a small knock but it’s nothing serious. We’ll move on and prepare for the next round. I’m really proud of our young players. They are growing up, we’ll see much more of them in the future. But that’s us finished for now. How did your team recover from 2-4 to force overtime? I can say this: we didn’t play badly in any of the previous games. We had chances in all of them. It came down to a goaltending duel and Hellberg was better. For our young guys, 19 or 20 years old, this was a heavy load and in the end it was a bit too much for them.